The first controls on foods for particular nutritional uses were introducted in 1977 by Directive 77/94. This created the concept of 'foods for particular nutritional uses' (commonly referred to as PARNUTS) and defined the concept in two ways. It stated that: "Foodstuffs for particular nutritional uses are foodstuffs which, owing to their special composition or manufacturing process , are clearly distinguishable from foodstuffs for normal consumption, which are suitable for their claimed nutritional purposes and which are marketed in such a way as to indicate such suitability." It then added that: "A particular nutritional use must fulfil the particular nutritional requirements: (i) of certain categories of persons whose digestive processes or metabolism are disturbed, or (ii) of certain categories of persons who are in a special physiological condition and who are therefore able to obtain special benefit from a controlled consumption of certain substances in foodstuffs, or (iii) of infants or young children in good health." It also reserved the use of the words 'dietetic' and 'dietary' to foods meeting these definitions. (a) infant formula and follow-on formula; (b) processed cereal-based food and baby food; (c) food for special medical purposes; (d) total diet replacement for weight control. It did also include the option of specific controls for 'Milk-based drinks and similar products intended for young children' and 'Food intended for sportspeople'. Controls on the four categories exist (see below). Following Commission reports on the 2 optional categories, it is unlikely that that these will be progressed. The title of the new Regulation is long and refers to the various categories to which it applies. 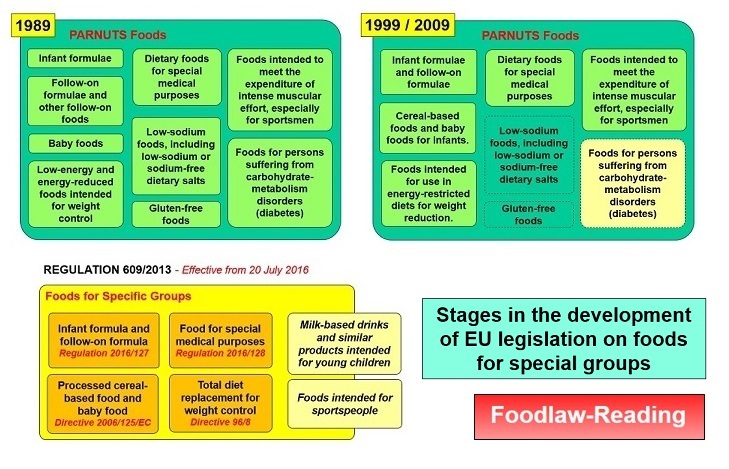 The simplified term, 'Food for Specific Groups' has therefore been informally adopted to cover these terms and to replace the original PARNUTS acronym. The Regulation became effective from 20 July 2016.